You are here: Home / About Sport Psychology Coaching / What Happens in a Sports Psychology Session? What Happens in a Sports Psychology Session? In the very first sports psychology session, we’ll go over your Athlete’s Mental Aptitude Profile (AMAP) assessment and discuss your background in sports. The objective is to understand the top mental skill areas you’ll want to improve for greater mental toughness. We ask that you bring in any statistics you have kept recently. And share your schedule or recent competitions you’ve had so we can get a complete picture of our current situation. We’re happy to talk to parents or coaches to gain greater insight of your mental game and performance—from their perspective. After we have discussed your AMAP assessment and went over some follow up questions, the next task is to develop a mental game plan that outlines the top areas we want to improve in your sports psychology coaching program. Depending on the program you enrolled in, we might complete this task during the session or between sessions. The mental game plan is a roadmap of what we’ll cover in your sports psychology coaching program and serves as a summary for you to review daily. Next, we begin with the coaching phase of mental training. In this phase, we give you strategies to help improve a specific area of your mental game. You’ll replace ineffective beliefs, habits, or routines with more effective ones. For example, we’ll identify the challenge, such as your top distractions, and then discuss how to cope with and refocus after distractions. This usually involves anticipating how you will react differently when distracted. Thus, the mental strategy of refocusing arms you with a strategy for reacting better after distractions. We use a specific model for learning mental skills during the coaching stage. This includes four important steps: (1) awareness, (2) education, (3) practice, and (4) application. In the beginning of your sports psychology coaching program, we spend time in the awareness stage of learning. This means helping you identify your top barriers to success and how they impact your performance. Often athletes are not aware of how their mental game can interfere with performance. The education stage is when we teach you the mental skills for greater consistency and success. 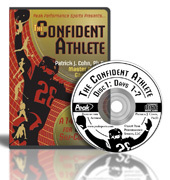 Here, you learn conceptual strategies that you can transfer to practice and competition. In the practice stage of coaching you apply what you learn to live practices and competition. You lean how to do this by teaching you pregame and post game routines. In the final stage, you transfer your new skills to competition. As you can see, sports psychology and mental game coaching is a long-term educational process and not a quick fix. It takes a strong commitment to your mental game to reap the benefits of sports psychology coaching. As we work through your mental game plan in each session, we review previous strategies with you to see how well you are able to implement them and what needs to improve. Each athlete improves at his or her own pace with sports psychology coaching depending on many factors, some that are beyond our control. We don’t expect you to be perfect with the mental game, but instead make steady improvements in your mindset. After a few mental training sessions, we use several tools in the sports psychology coaching process to help you practice and apply mental skills you learn in the sports psychology sessions. These include pregame audio programs, checklists, summary sheets, imagery programs, and post-game performance feedback strategies. Our work during the sports psychology sessions is only the start of your improvement. In between sessions, you’ll continue to work on your mental game improvement by completing our Mental Edge workbooks, post-performance feedback sheets, eBooks and custom audio programs. Please contact us at Sports Psychology Coach by Peak Performance Sports to learn more about personal coaching programs for athletes and teams. Read more articles about sports psychology coaching.